Absolute Drift is an interesting top down car game, that focuses much more on drifting and the control of the car, rather than racing. You'll be doing your best to drift around corners, doing donuts, and fish tails in order to score as much points and to accomplish as much tasks as possible. 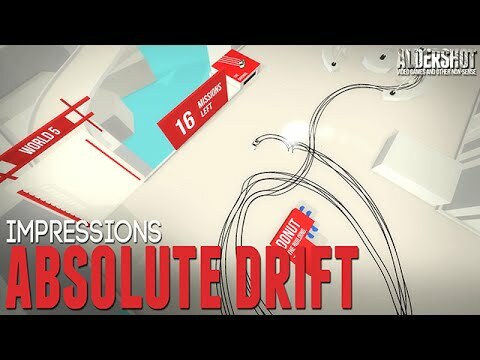 Absolute Drift: Impressions (Drift driving adventure game, indie, gameplay, and review) Absolute Drift is an interesting top down driving indie game, that focuses on drifting more than racing. Once in the game you'll be thrown into a somewhat open world where you'll be doing various tasks, such as ramp jumping, donuts, fish tails, and other drifting and driving challenges. Once the section of the map's tasks are complete, it'll open up new areas of the game. While exploring this semi-open world, you'll also be given the opportunity to enter one of it's many mini-missions where you'll be aiming for high scores on the leader board. The game also features multiple car models, and colour and pattern customization as well. The biggest hurdle to Absolute Drift is it's learning curve. It's not an easy game to master and make little concession to beginning or even intermediate players. The controls are difficult at first, as the car feel very differnt from other driving games, and the ground feels something like ice. Spinning out and losing control of your car will probably be your first 30 minutes or more of your experiance. This might prove frustrating to players who don't play a lot of driving games (like me) but when you start to get the hang of things, and the small amounts of progress that you make in your driving ability really does feel rewarding. How ever, if you are a fan of driving games, it's focus on high teir play may very well be an attraction to you. The game also looks great, as it's polished and clean look catches the eye, with it's minimalist design, with great music that suit the game's look and feel. Infact, the game's OST was one of the main motavators to push through the initial frustration of the controls. I just wanted to keep playing so I could keep listening to the amazing sound track. Overall, Absolute Drift is an interesting car game that I mostly enjoyed. I loved the presentation, I love the music, I love the concept. The only thing holding me back from enjoying the game to it's full potential is my sucky driving in combination with the game's extremly high learning curve.